Made this triptych for someone special as a holiday gift. 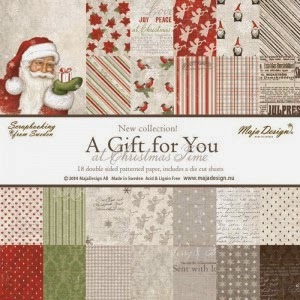 I used the “A gift for you” collection from Maja Design. On the front I used the “shipped from the North Pole” sheet for the background. Added some strips of this sheet and pieces of “when the snow is falling” and “on Christmas morning”. The lovely handles are from Scrap-Unlimited, a Dutch online store. They were given a touch of gesso. Embellished it with a big white flower from 13Arts and small roses and mini cotton balls. A lovely scenery on the inside with a torn piece of the “on Christmas morning” sheet. All the small sides were decorated with the backside of the “on Christmas morning” sheet. For the bottom edges I mixed some modeling paste with 13Arts glass filler. The total inside with room for some journaling. The journaling card comes from the pictures and tags sheet. This is gorgeous!! What size is it? It’s already in the mail to someone special 🙂 but I think it was about 15cm x 25cm. Awesome gift, that someone is really lucky to get this piece of art!